We have recently presented a geometry dual to a Schwinger-Keldysh closed time contour, with two equal β/2 length Euclidean sections, which can be thought of as dual to the Thermo Field Dynamics formulation of the boundary CFT. 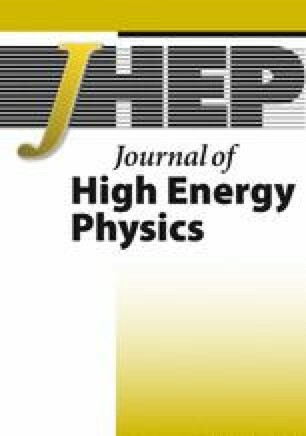 In this work we study non-perturbative holographic excitations of the thermal vacuum by turning on asymptotic Euclidean sources. In the large-N approximation the states are found to be thermal coherent states and we manage to compute its eigenvalues. We pay special attention to the high temperature regime where the manifold is built from pieces of Euclidean and Lorentzian black hole geometries. In this case, the real time segments of the Schwinger-Keldysh contour get connected by an Einstein-Rosen wormhole through the bulk, which we identify as the exterior of a single maximally extended black hole. The Thermal-AdS case is also considered but, the Lorentzian regions become disconnected, its results mostly follows from the zero temperature case. M. Botta-Cantcheff, P. Martínez and G.A. Silva, On excited states in real-time AdS/CFT, JHEP 02 (2016) 171 [arXiv:1512.07850] [INSPIRE]. T. Banks, M.R. Douglas, G.T. Horowitz and E.J. Martinec, AdS dynamics from conformal field theory, hep-th/9808016 [INSPIRE]. M. Botta-Cantcheff, P.J. Martínez and G.A. Silva, Interacting fields in real-time AdS/CFT, JHEP 03 (2017) 148 [arXiv:1703.02384] [INSPIRE]. M. Van Raamsdonk, Building up spacetime with quantum entanglement II: It from BC-bit, arXiv:1809.01197 [INSPIRE]. J. Sonner and B. Withers, Linear gravity from conformal symmetry, arXiv:1810.12923 [INSPIRE]. M. Botta-Cantcheff, P.J. Martínez and G.A. Silva, The gravity dual of real-time CFT at finite temperature, JHEP 11 (2018) 129 [arXiv:1808.10306] [INSPIRE]. B.C. van Rees, Real-time gauge/gravity duality and ingoing boundary conditions, Nucl. Phys. Proc. Suppl. 192-193 (2009) 193 [arXiv:0902.4010] [INSPIRE]. M. Botta-Cantcheff and P.J. Martínez, Which quantum states are dual to classical spacetimes?, arXiv:1703.03483 [INSPIRE]. A.L. Fitzpatrick and J. Kaplan, Scattering states in AdS/CFT, arXiv:1104.2597 [INSPIRE]. A. Maloney, Geometric microstates for the three dimensional black hole?, arXiv:1508.04079 [INSPIRE]. M. Bañados, M. Henneaux, C. Teitelboim and J. Zanelli, Geometry of the (2 + 1) black hole, Phys. Rev. D 48 (1993) 1506 [Erratum ibid. D 88 (2013) 069902] [gr-qc/9302012] [INSPIRE]. E. D’Hoker and D.Z. Freedman, Supersymmetric gauge theories and the AdS/CFT correspondence, hep-th/0201253 [INSPIRE]. P. Glorioso, M. Crossley and H. Liu, A prescription for holographic Schwinger-Keldysh contour in non-equilibrium systems, arXiv:1812.08785 [INSPIRE]. S. Hemming and E. Keski-Vakkuri, Hawking radiation from AdS black holes, Phys. Rev. D 64 (2001) 044006 [gr-qc/0005115] [INSPIRE]. D. Harlow and D. Stanford, Operator dictionaries and wave functions in AdS/CFT and dS/CFT, arXiv:1104.2621 [INSPIRE].